The public meeting in Beadnell on Northumberland Estates' outline plans for 45 homes to the south of Kennedy Green. Scores of residents turned out for a meeting in Beadnell earlier today to encourage villagers to fight plans for another housing development. The meeting, in the WI Hut, had been called to underline opposition to Northumberland Estates’ outline bid for 45 new homes and a new access road on land south of Kennedy Green, which could well go before the county council’s planning committee in December or January. The site of Northumberland Estates' outline plans for 45 homes to the south of Kennedy Green. She handed over to campaigner Andy Brown, who has set up www.beadnellunderthreat.com and emphasised the need for the community to lodge individual objections with Northumberland County Council – there are currently 127 objectors. He explained that the aim is to persuade planning officer Neil Armstrong to recommend refusal to the committee members. “If there’s a recommendation for acceptance then we are probably shot beneath the water-line,” he added. The approximate location of where the access road is proposed for Northumberland Estates' outline plans for 45 homes to the south of Kennedy Green. Summarising the main reasons for objection later in the meeting, he listed the impact on the AONB (area of outstanding natural beauty), referring to paragraphs 114, 115 and 116 of the National Planning Policy Framework (NPPF); the large number of second homes; sustainability, as the village has no full-time employment, no school and a bad bus service; and impact on infrastructure, both the roads and utilities such as water, sewerage and electricity. On the second-homes issue, a recently-amended, proposed section 106 legal agreement would mean that the properties could only sell to residents for the first 12 months, but Mr Brown and others at the meeting thought that this would have little impact. 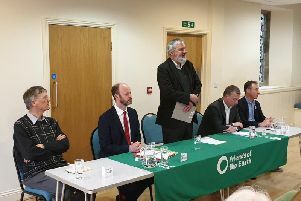 Mr Brown explained that of the 45, nine would be social or affordable homes and may go to locals, while another four are two-bedroom properties which may be purchased by people retiring to the village. That leaves 32 three and four-bedroom homes which most likely won’t sell to families because of the lack of jobs, school and infrastructure. Residents at the meeting raised a number of issues, but the strain on the sewerage and other utilities and the pressures of tourism and visitors on the roads and the car park – all of which already exist – were among the key concerns. One woman, a second-home owner herself, pointed out that more housing will not help attract tourists and visitors anyway as they ‘won’t want it looking like Milton Keynes by the Sea’.